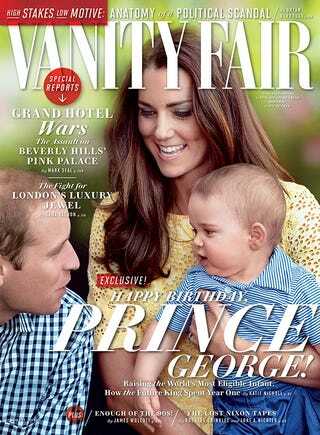 Nicholl reports that William and Kate want George to enjoy a normal upbringing. They take George to playdates at the homes of friends, among them Kate's old Marlborough friend Alice St. John Webster, who has a baby several months older than George. As for speculation about when Prince George will have a sibling, Nicholl reports that there are rumors among the couple's friends that they plan to try this summer. Wait: What happened to the TWINS the tabloids have claimed Kate Middleton was pregnant with at least four times? It's unclear if there's any Wee Prince George potty training news inside — you'll have to pick up a copy of the mag.